Harambee Stars progressed to the final of the CECAFA Senior Challenge Cup with a slim 1-0 win over Burundi at the Moi Stadium in Kisumu. The solitary goal was scored by Whyvonne Isuza in the sixth minute off the first period of extra time. The game had to go for a further 30 minutes after the regular 90 ended in a barren draw. Kenya will now play the winner between Uganda and Zanzibar who play on the same venue on Friday. Paul Put, the Harambee Stars coach admitted his side was not at their best in the game. “We were very lucky especially in the first half because Burundi came very strongly. We have played four games and travelled all the way here while Burundi have played three and travelled only an hour. The difference was clear but I am happy we came out winners,” Put said. Oliver Niyungeko, his Burundi counterpart was frustrated especially after creating and missing many open chances. “That is how football is unfortunately. You can dominate the game but if you don’t finish your chances, you will be punished. It is a difficult learning curve for us,” the coach stated. Burundi dominated the game especially in the first half when they created numerous scoring chances. They were delighted with the return of striker Abdul Razak Fiston who had signed a deal in Angola. But, he could not inspire them to victory. Patrick Matasi, the Kenya shot stopper was called into action in the 10th minute when he was forced to quickly back-peddle and tip over a curling corner taken by Shasir Nahimana. Burundi came ever so close four minutes later but Musa Mohammed cleared off the line. Shabaan Hussein who had been a thorn down the left wing headed in from a Laudit Mavugo cross with keeper Matasi already beaten. However, an onrushing Mohammed thumped the ball away. Shabaan, Fiston, Mavugo and Nahimana were Burundi’s main dangermen upfront and they took turns in running rings around the Kenyan backline. Midfielder Pierre Kwizera had outmuscled both Patilla Omotto and Ernest Wendo to win and spray balls from the middle of the pack. In the 28th minute, Shabaan had a shot fly over from distance after gliding his way smoothly past Kenyan markers on the right before shifting to a favorable shooting position. Kenya’s only chance of the first half fell on Ovellah Ochieng who delightfully controlled the ball inside the box, but his effort one on one with the keeper was saved. Towards the end of the half, Dennis Sikhayi made a superb tackle inside the box to deny Nahimana who had broken into the box from a Fiston ball on the left which had left Matasi for the dead. 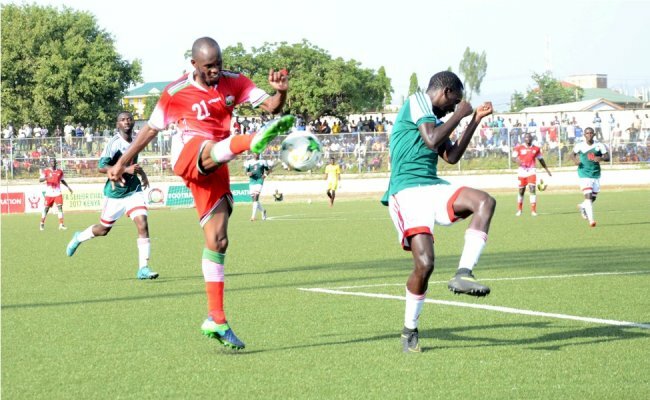 In the second half, Burundi continued to dominate and just two minutes in, centre back Moussa Omar saw his header off a Kwizera corner drop wide at the far post. Harambee Stars' dominance in the game started showing flashes in the 70th minute with Ovellah having two chances with shots from the right. His first was straight at the keeper while his second after a one-two change of passes with Kepha Aswani was awry. There were huge concerns for coach Put when defender Mohammed limped off injured while striker Vincent Oburu followed later. They were to be replaced by Duncan Otieno and Samuel Onyango. Five minutes to time, Aswani came close for Kenya when he rose in to hook to a Wesley Onguso long throw with the keeper also challenging, but the ball went wide. With no outright winner in 90 minutes, the game went into the extra mile. Both sets of players appeared jaded with the blazing sun on the artificial turf. But it was Kenya who had the most needed strength to move across the line. Six minutes after the restart, Isuza picked up a low cross from substitute Onyango before curling it into the top left corner of the goal. Harambee Stars guarded the slim lead jealousy to keep on track for their fifth CECAFA crown. December 3: Kenya 2 Rwanda 0, Libya 0 Tanzania 0; December 4: Uganda 0 Burundi 0. December 5: Zanzibar 3 Rwanda 1, Kenya 0 Libya 0; December 7: Tanzania 1 Zanzibar 2, Rwanda 0 Libya 0, Ethiopia 1 Burundi 4; December 8: Uganda 5 South Sudan 1; December 9: Rwanda 2 Tanzania1, Kenya 0 Zanzibar 0; December 10: Ethiopia 1 Uganda 1; December 11: Libya 1 Zanzibar 0, Kenya 1 Tanzania 0, South Sudan 0 Burundi 0. December 14: Semi finals – Kenya 1 Burundi 0. December 15: Semi-final – Uganda v Zanzibar (Moi Stadium, Kisumu); December 16: Rest Day: December 17: Third and fourth play-off/Final.